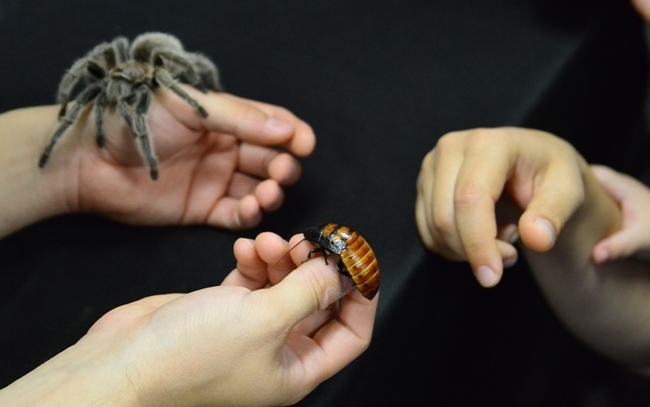 It's finals week at the University of California, Davis, and what a great opportunity to take time to de-stress...with bugs! 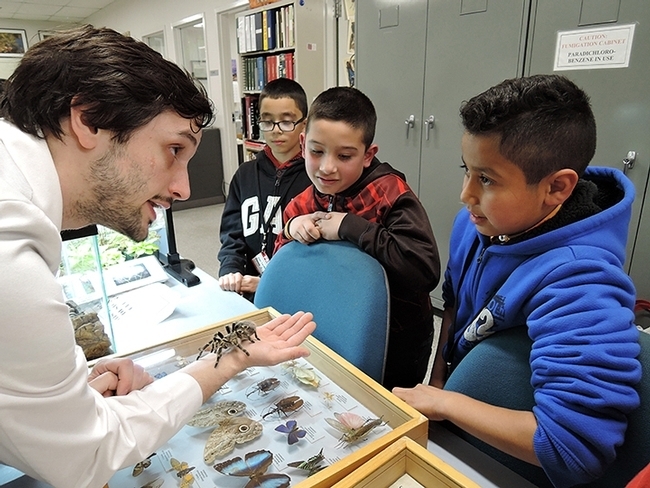 Wade Spencer, entomology student and associate at the Bohart Museum of Entomology, says that students studying in the UC Davis LGBTQUIA Resource Center at 397 Hutchison Drive on Tuesday, March 19, will be sharing their space with bugs, including Coco McFluffin, a Chaco golden knee tarantula that makes its home in the Bohart Museum of Entomology. The Bohart Museum, located in Room 1124 of the Academic Surge Building on Crocker Lane, houses a global collection of nearly eight million insect specimens--AND a live petting zoo of dozens of critters, ranging from Madagascar hissing cockroaches to stick insects to tarantulas. 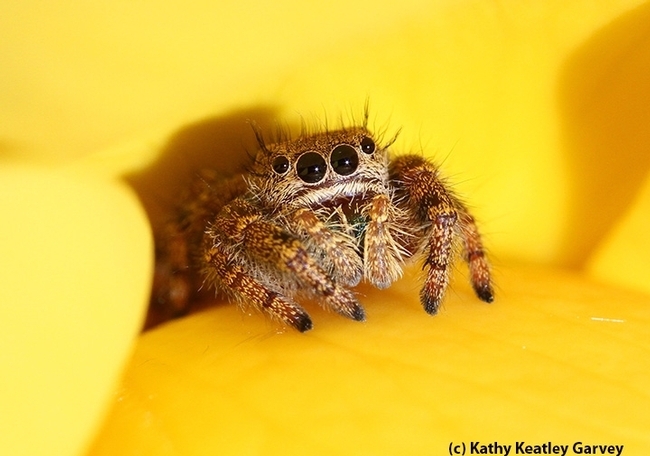 Billed as the "Finals-Week Bug Meet-n-Greet De-Stressor," the event takes place from noon to 1 p.m. in partnership with LGBTQUIA and the Bohart Museum. And...Wade Spencer's tiny Arizona burrowing scorpion (Captain Mar-Vel): "I don't know the scientific name of her yet and can't seem to find any info online. But she's cute and tiny!" "It should be noted," Spencer said, "that the only venomous arthropod that will be up for touching/holding will be Coco." 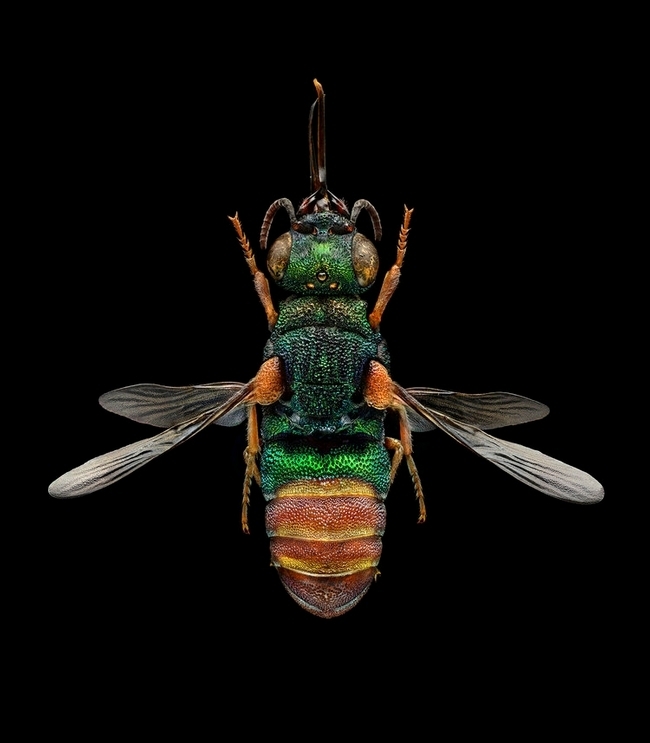 This ruby-tailed wasp, the work of Levon Biss, measures 5x6 feet. The Bohart Museum hopes to acquire another microsculpture by Biss. "Giving Tuesday," held the first Tuesday after Thanksgiving, is a good day to give back, to say "Thank you for all you do!" The 92nd Street Y and the United Nations Foundation launched "Giving Tuesday" in 2012 in response to the troubling commercialization and consumerism in the post-Thanksgiving season (think Black Friday and Cyber Monday). A very worthy benefactor on "Giving Tuesday" is the UC Davis Bohart Museum of Entomology, located in Room 1124 of the Academic Surge Building on the UC Davis campus. 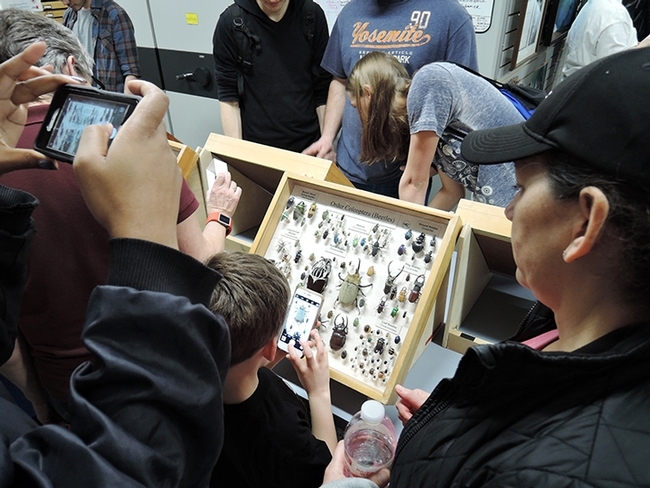 Directed by Lynn Kimsey, UC Davis professor of entomology, the insect museum is named for its founder, noted entomologist Richard M. Bohart (1913-2007), a professor and former chair of the UC Davis Department of Entomology (now the UC Davis Department of Entomology and Nematology). He founded the museum in 1946. The Bohart Museum's outreach efforts are widespread and much appreciated: from classroom visits to open houses. 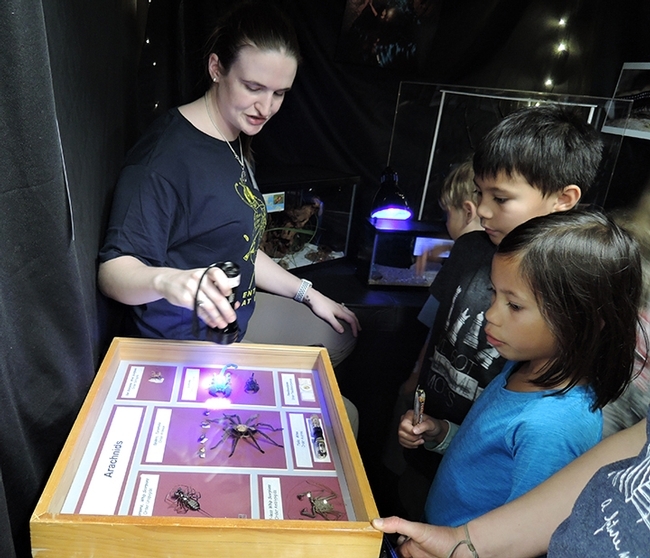 Tabatha Yang, education and outreach coordinator, and associates provide educational programs to classrooms and at special events, such as exhibitions at the Davis Explorit Science Center, California State Fair and Solano County Youth Ag Day. 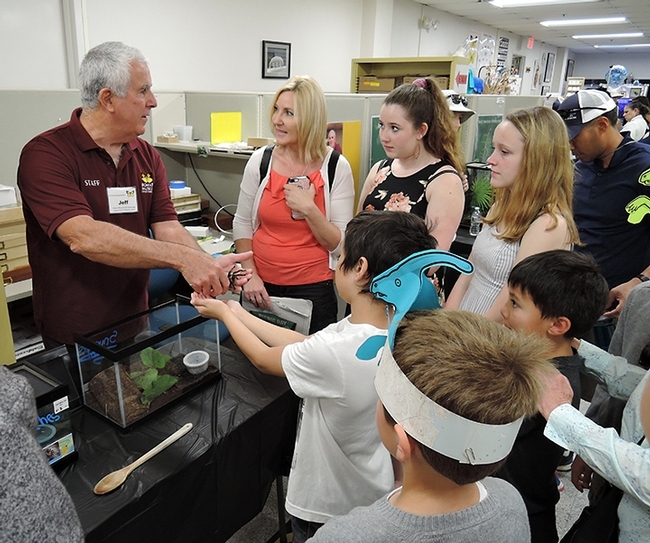 Youths learn about insects and other arthropods and eagerly hold the walking sticks and Madagascar hissing cockroaches. Another key part of the Bohart Museum outreach efforts: they host open houses at scheduled times on weekends throughout the academic year. On the campuswide Picnic Day, the Bohart draws as many as 4000 visitors. Thousands also attend the UC Davis Biodiversity Museum Day. (See video on YouTube). 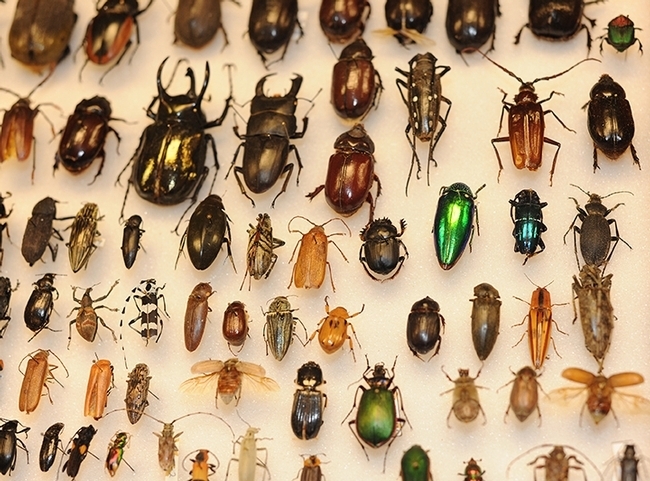 Scientists throughout the world study the insect collection. What does the Bohart need? "Support for our outreach programs," said Kimsey. "I would love to get another photograph like the Biss one we have in the hall." That would be like the newly acquired 5x6-foot photographic image or "microsculpture" of a cuckoo or emerald wasp, the work of noted British photographer Levon Biss. The “cuckoo” name refers to the fact that the female lays her eggs in the nests of unsuspecting hosts, including the sand wasp. The larvae of the cuckoo wasp then consume the host eggs, larvae and the stored food. The wasp is found throughout Europe but not in the United States. Biss's intricate work, titled "Ruby-Tailed Wasp" (Parnopes grandior), encompasses more than 8,000 separate images, Kimsey said. “We chose it partly to honor the work that ‘Doc' Bohart did." 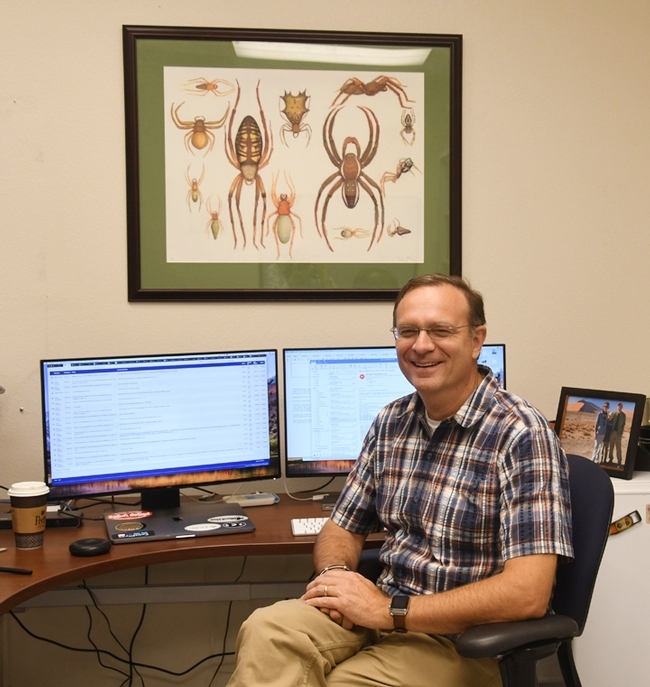 Bohart spent much of his career studying chrysidid wasps or parasitoid wasps. Biss, based in London, works across many genres, including news, sports, portraiture and insects. 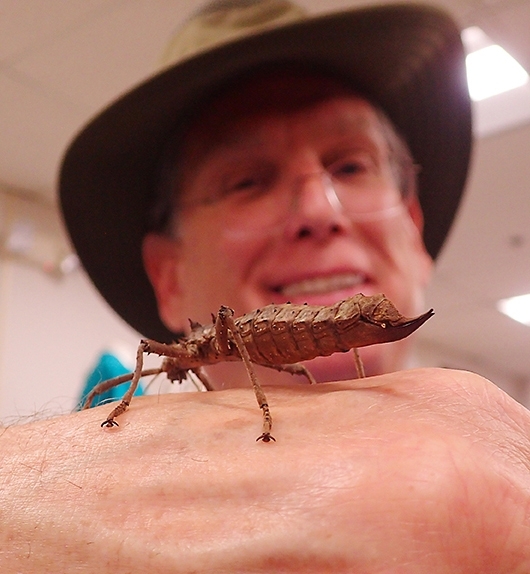 He credits his son, Sebastian, for developing his interest in insects. Sebastian found a ground beetle in their backyard and Dad photographed it. 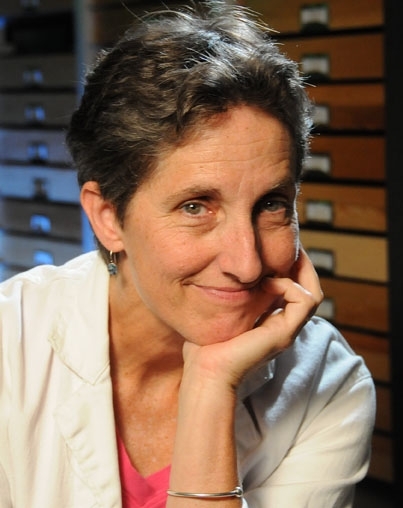 That led to a collaboration with the Oxford Museum of Natural History, where Biss gained access to the museum's historical collection of insects, including some collected by Charles Darwin. In October 2017, Biss drew rave reviews for his TED talk, Mind-Blowing Magnified Portraits of Insects. That led to a world gallery tour of his images; his show is now at the Houston (Texas) Museum of Natural Science, July 13, 2018 through Jan. 13, 2019. 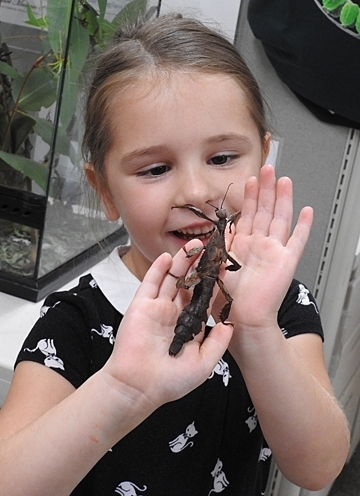 Unlike many insect museums, the Bohart Museum is open to the general public four days a week: Mondays through Thursdays, from 9 a.m. to noon and from 1 to 5 p.m., plus occasional, weekend open houses​. Admission is free. They came. They saw. They bugged out. 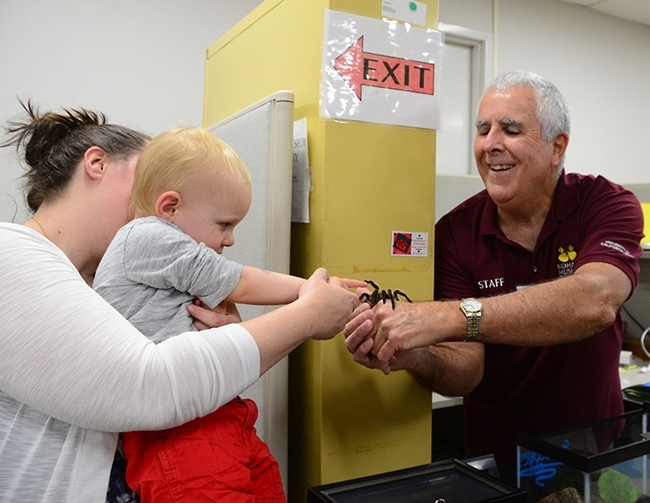 Who wouldn't, when you get an opportunity to pet a rose-haired tarantula named Snuggles, guide walking sticks "strolling" on your arm, or cradle a Madagascar hissing cockroach? Or marvel at the display of Platypsyllus castoris, an ectoparasite of beavers? 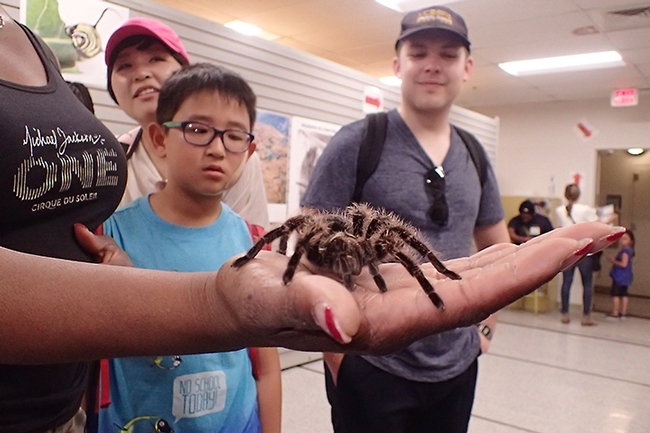 That's what awaited the 2000 visitors at the Bohart Museum of Entomology during the 104th annual UC Davis Picnic Day last Saturday, April 18. 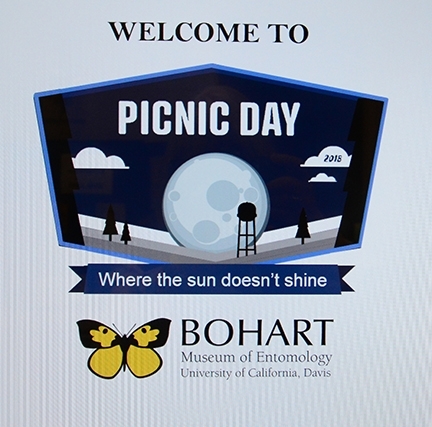 Although the theme of the campuswide Picnic Day spanned "Where the Sun Shines," Bohart Museum officials focused on "Where the Sun Doesn't Shine." 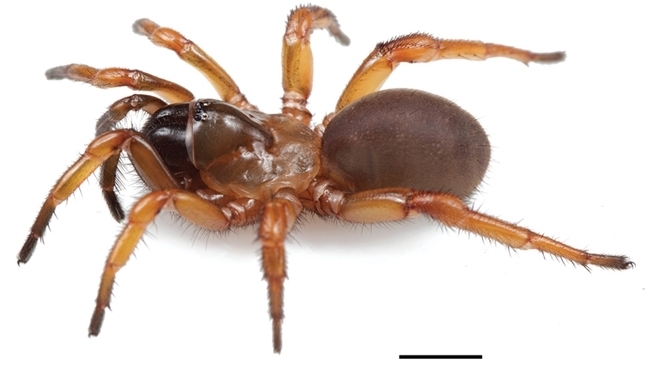 They highlighted nocturnal insects, cave-dwelling insects, and parasites, including a beetle, Platypsyllus castoris, found on the south end of a beaver. 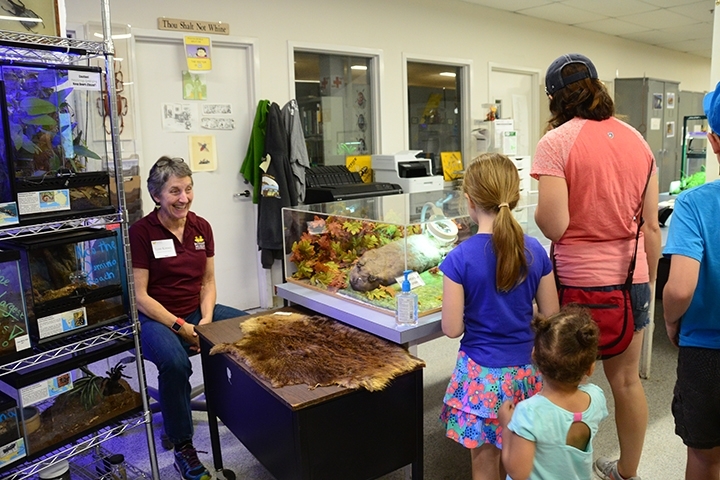 Lynn Kimsey, director of the Bohart and professor of entomology at UC Davis, kept busy answering questions about the beaver display--a pelt, and a graphic of the beetle. As Bohart Museum associate and undergraduate entomology student Wade Spencer said: "These beetles look like they are to fleas what halibut are to other fishes. Instead of the lateral compression fleas exhibit, Platyspyllus castoris are dorso-ventrally flattened, which only adds to their alien appearance. Their unique feeding and lodging preferences have given us so many good laughs, we wanted to make them the star of this year's picnic day event at the Bohart." "To be a tad more descriptive," Spencer said, "they call the beaver's perianal region home; they help keep the beavers clean both inside AND out by feeding on dead skin, secretions of the castor glands (where "natural" and "raspberry" flavorings come from), and if they are in the mood, they'll indulge in a little blood or fluids from oozing wounds. 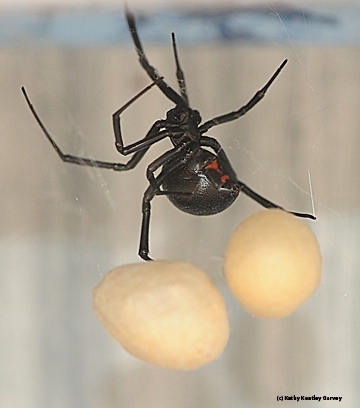 They're basically like crawling, itchy, toilet paper that occasionally bites and you can never scratch off!" 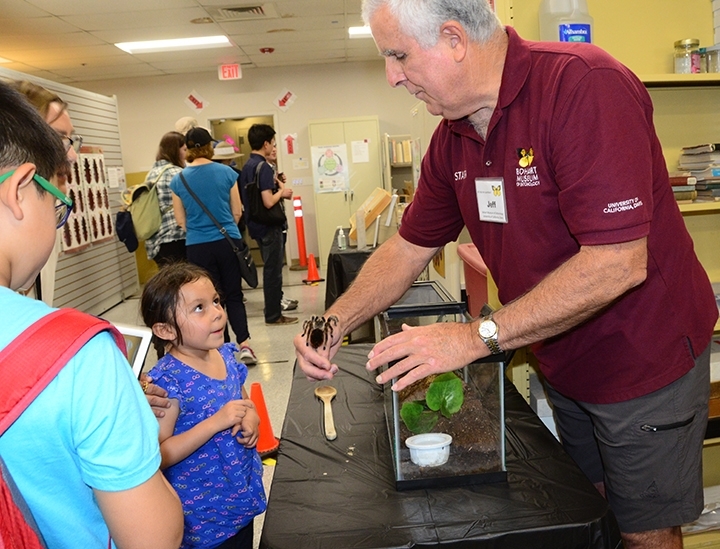 Entomologist Jeff Smith, who curates the butterfly and moth collection at the Bohart, kept busy encouraging visitors to get acquainted with Snuggles. They held him, petted him and photographed him. Little Teddy Owens, 2 of Davis, held by his mother, Dina, high-fived Snuggles. Another display featured scorpions: graduate student Charlotte Herbert shone a black light on them to illustrate how they glow in the dark. All scorpions fluoresce in ultraviolet light. Visitors also learned about bees in a display featuring sweat bees, leaf-cutting bees, mason bees, bumble bees, honey bees, sunflower bees, and carpenter bees, as well as Andrena and Melissodes anthophora. 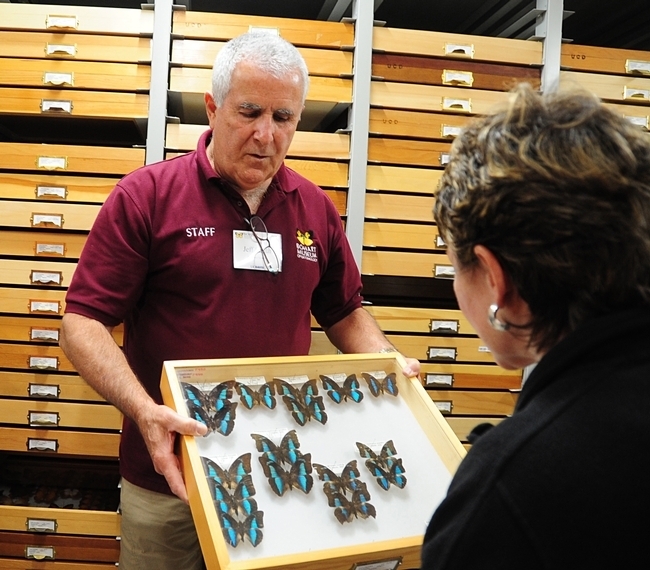 The Bohart Museum houses a global collection of nearly eight million specimens. 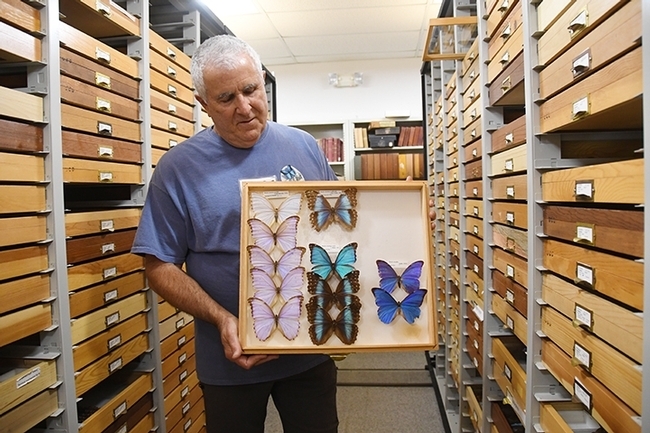 It is the home of the seventh largest insect collection in North America, and the California Insect Survey, a storehouse of the insect biodiversity. 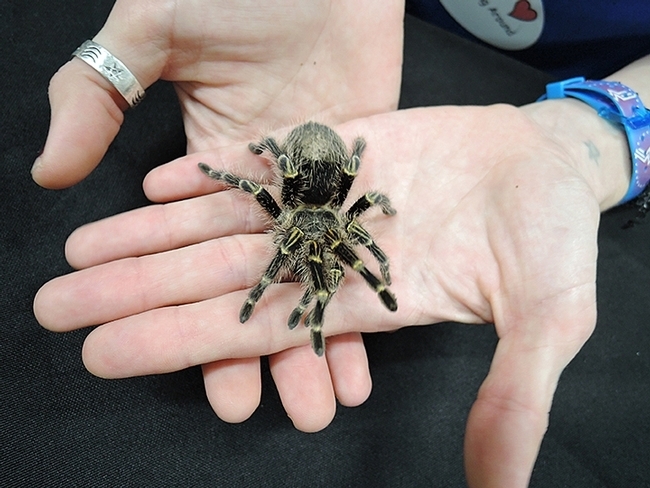 Special attractions include a “live” petting zoo, featuring Madagascar hissing cockroaches, walking sticks, praying mantids and tarantulas. 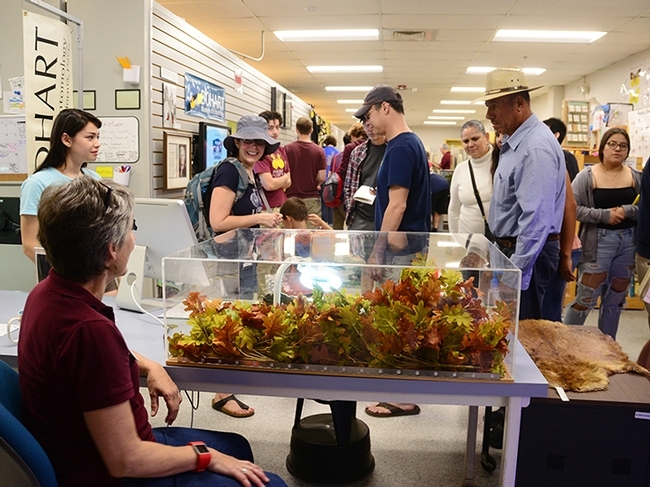 The museum's gift shop, open year around, offers T-shirts, sweatshirts, books, jewelry, posters, insect-collecting equipment and insect-themed candy.